To paraphrase O Wilde – to preside over the transformation of one major domain of BBC content into a living linked data archive in the course of the year may be regarded as good fortune; to do both looks like design. Chapeau! Great stuff – really brings it all to life, I had great fun exploring the different ways of navigating between species etc. Absolutely fantastic! Big up Tom Scott! This is really excellent and nice to see dbpedia identifiers in there. Congrats to you and the team! Thanks everyone. I’m very proud of what we’ve achieved. is that what ” The clip pages aren’t yet linked in with their owning episode, but they will be soon.” means? @juniorbonner sorry about the bugs and thank you for reporting them. We know the audio player is a bit small, and will be fixed soon. I hadn’t spotted the Facebook bug – thanks, I’ll raise that bug. In the meantime if you add /sounds to the end of the URL e.g. 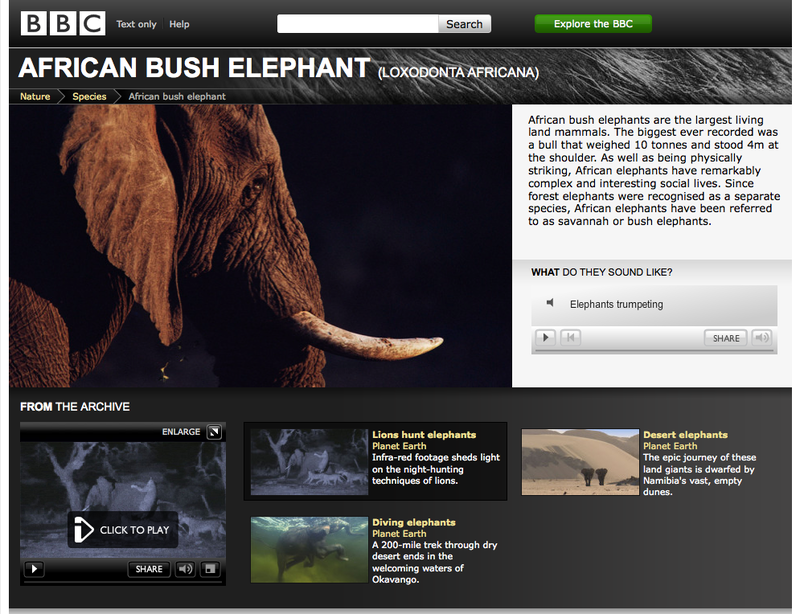 http://www.bbc.co.uk/nature/species/Lion/sounds then you get a list of available sound URLs. Likewise the iPlayer video links is a known bug and the relevant team are working on a fix. The problem is that it’s linking to the owning episode rather than the clip page. Integration with the Encyclopedia of Life would be nice. 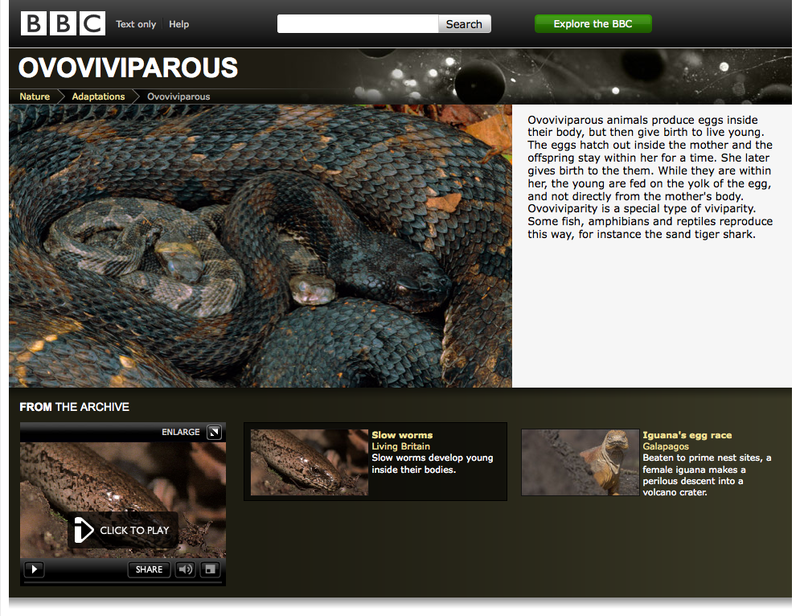 Each species page in the Natural History archive could link to the corresponding page in EOL. Yes indeed – I want to automate the process rather than maintaining the links by hand, there’s an item on the backlog to do just that. You should have the lot. I don’t think this was happening before I went on holiday a week ago, but I could be wrong?? Philip, looks like we’re having a little config issue with some of our servers, we’re on the case. Thanks for reporting it. The apostroph bug is all fixed, everything should be working again as normal. Sorry about that. Right, I think I’ve now got everything linked from Freebase. 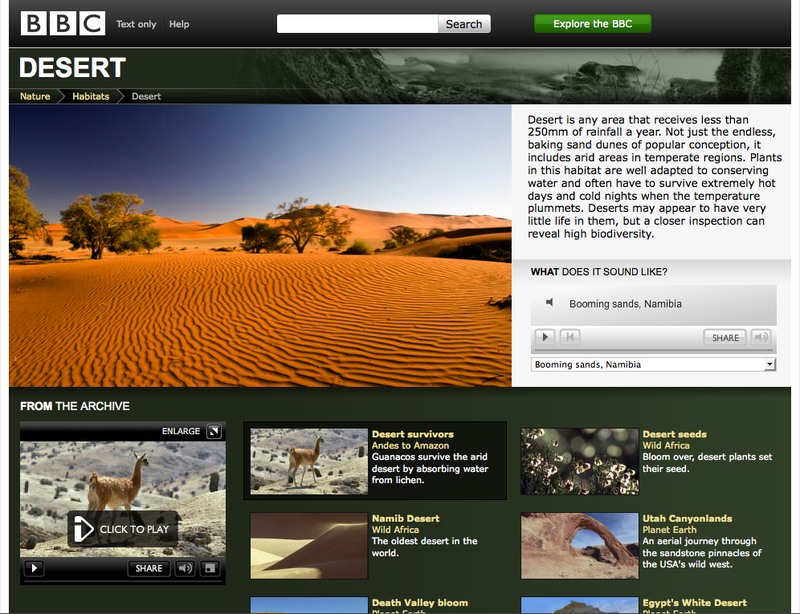 See eg the Snow Leopard page there, and note the “BBC Natural History” weblink on the right-hand side. The only thing I know which isn’t working is anything with a non-ASCII character in the key, which is triggering a bug in the Freebase web client so the keys don’t appear there. If you want to link back to the Freebase pages, it should just be a matter of linking to http://www.freebase.com/view/wikipedia/en/, except you’ll have to deal with Freebase’s slightly quirky encoding, which replaces everything outside the set [0-9A-Za-z_-] with a $xxxx encoding, where xxxx is the hex-encoding of the Unicode codepoint of the character; for example, apostrophe becomes $0027. Very nice – we’ve tracked down the encoding bug and the fix should be live tomorrow morning. How are you keeping things up to date? Are you spidering those pages on a regular basis? If not FYI we’ve a bunch of new taxa going live next week. And indeed I would like to link to Freebase. Backlog item created. I’m not spidering the pages on a regular basis per se, but there’s a script on my laptop which I can run whenever to pick up any changes. Are you going to be adding any “categories” other than the 8 you listed above? (just as that requires a small amount of work at the Freebase end). At the moment, I’m not finding it completely trivial to link to bbc.co.uk: say I’ve got the key “Snow_Leopard”. I can’t determine solely from that key the URL to link to, as I’ve got to know that it’s a species (and also that species are found in the /species/ directory on bbc.co.uk). Would it be at all possible to create something like http://www.bbc.co.uk/nature/key/Snow_Leopard which would redirect to the correct page? I’ve just spidered the new links and I think there may be one small problem: the /nature/species page is linking to /nature/species/Doria’s_Tree-Kangaroo rather than /nature/species/Doria’s_Tree-kangaroo (note case of “K”). The former page doesn’t have the Wikipedia article or “Elsewhere on the web” sections (and breaks my script as there’s no “Doria’s Tree-Kangaroo” article at Wikipedia :-) ). The /genus/Tree-kangaroo page has the correct link. Philip – sorry about that, we’ll get that fixed. Phil – it should be fixed now.